After all the savoury recipes I’ve added lately, I thought it was about time for a dessert. I didn’t really plan for it, I just hapenned to have a pineapple at home and had no clue what to do with it..and I honestly didn’t want it to go to waste..seemed like making a cake with it was the best option at the time..trying to reason with myself it’s not just my greed , ”I’m just trying to be economical”.. oh well, any reason is good to make a cake,so let’s get on with it. 1) peel and cut your pineapple into chunks, set them aside for now. 2) use a hand-mixer or a wooden spoon to mix up the dough. Put your soft butter into a large bowl, add your sugar and vanilla sugar, mix until soft,light,pale & fluffy. 3) Once your butter is the right consistency, add one egg at a time, then mix it in well before adding the next. if the mixture looks curdled- it’s okay, it’ll come back together after adding the flour. (if you want to add any aromatics, such as coconut flavouring,rum extract or cinammon-do it now.) I like it natural. 4) sift your flour in,add the baking powder and mix until the dough is well-combined,thick and smooth. then add your raisins and mix them through evenly. 5) grease your baking tin and line the bottom with baking paper. scoop your dough in the middle, smooth it out with a spoon. place your pineapple pieces on top, pressing them in slightly. You could sprinkle some coarse sugar on top if you want to. 6) bake in a preheated oven, 170C for about 45-55 minutes, times may vary, just bake until the cake is golden and puffed up, and when you insert a skewer in the middle and it comes out clean- it’s ready. 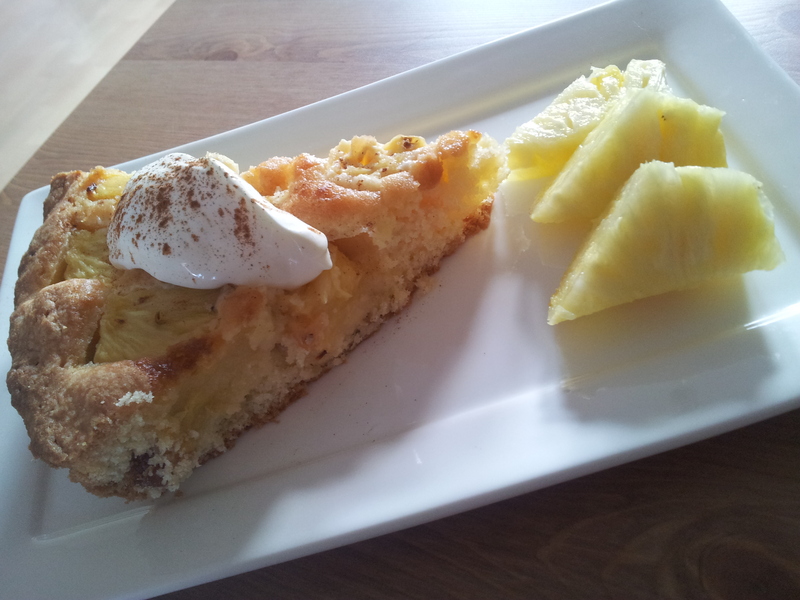 serve with some more pineapple slices, a dollop of creme fraiche and a sprinkling of cinammon. 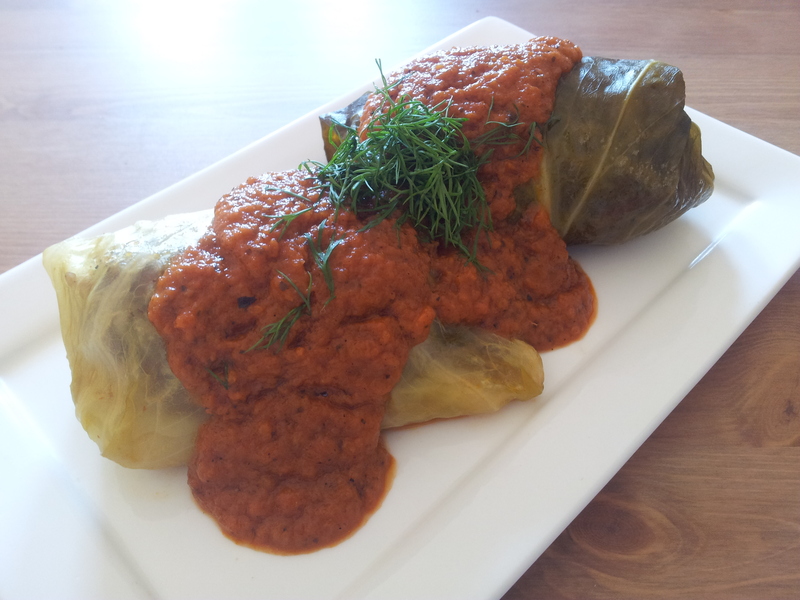 This dish is by NO means authentic, although I did keep to the traditional flavour profile,I promise ;). 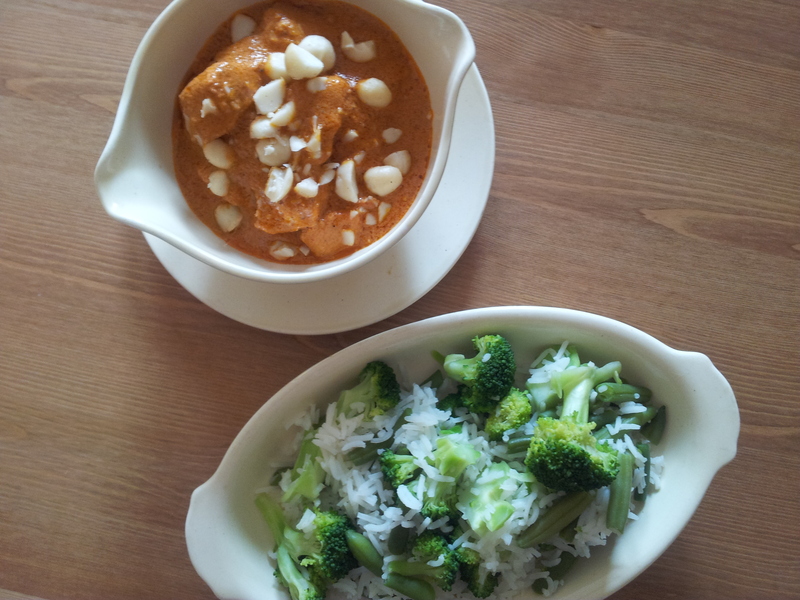 The original chciken tikka is much heavier and much spicier in my opinion. 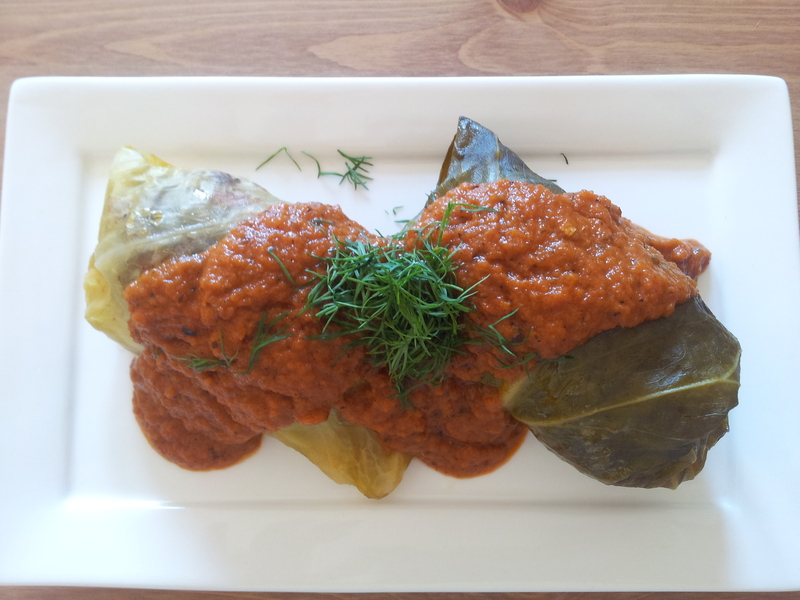 I wanted to create a lighter, quicker and milder version of this indian classic. I think it turned out really well, and I hope some of you will give it a go. 3) while your rice & veg are cooking, heat up a non-stick pan,season the chicken with salt now and fry it off, you don’t have to cook it all the way through, just make sure it’s all browned off and that the marinade doesn’t burn. when it’s sealed from all sides- add your creme fraiche and let it melt, mix well , so all the pieces are well covered in the sauce. if the sauce seems too thick-just add a tiny dash of water. Let it simmer for a few minutes, so all the spices and the chicken cook through. (about 5-7min). 4) by the time the rice is done, your chicken should be ready too. check at the end for seasoning, add the sugar to balance out the sour tomato paste, and make sure the amount of salt is right too. 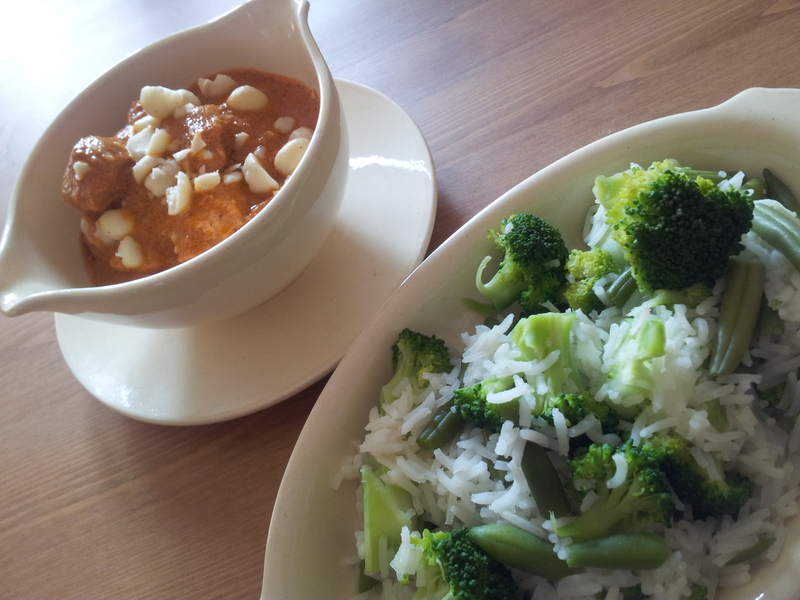 5) serve right away, with a sprinkling of macadamia nuts on top of your tikka. 5 large tomatoes- peeled, deseeded, diced. 1) mix your half-cooked rice and your raw meat, along with one , finely chopped onion, 2 minced garlic cloves, 1 tbsp of dried marjoram and all the lardons, in one bowl. Season to taste with salt and pepper. (if you have salted the water which you’ve cooked the rice in, go easy on the salt). 2) divide the mixture into 14 portions, take one leaf at a time, lay it flat, place a portion (make sure it’s not too big) on the bottom end of the leaf and roll it half way, fold the sides over and tuck them in tightly, roll over to the end, place seem-down on a plate. repeat the process until all of your meat and cabbage is gone. 3) any leftover cabbage trimmings you have can be used as a ”bottom” in the pot, that will prevent the wraps from burning etc. place the trimmings in your pot(or heavy based,deep saucepan), place the wraps on top (tightly,seem down) and pour in the chicken stock (you can use water). simmer slowly for about 40-45min with the lid on, checking every now and then for the amount of liquid in the pot, if it’s too dry, add some more. after that your cabbage wraps are ready. 1) heat up the olive oil in a heavy based sauce pan, fry the onions and the garlic until slightly soft and shiny. Add your fresh tomatoes and fry off for about 4-5 min. Add Your tomato puree, your dried herbs, salt,pepper,some sugar (you could add some balsamic vinegar at this stage too), then add about 100-150ml of water and simmer until all of the tomatoes fall apart forming a thick sauce. You may want to check for the consistency a few times and add some water if the mixture is too thick. after about 30-40min the tomatoes should be fully cooked , check the seasoning , you can add some cayenne pepper,make sure there’s enough salt,pepper and sugar (to balance out the acidity in the tomatoes). blend the sauce briefly with a hand-blender. This recipe is for someone who doesn’t like stand in the kitchen for hours on end, using 10 pots and 3 pans, waiting too long for their dinner. To be completely honest- I was done from start to finish in 17min, so I wasn’s sure if I should call it a 15 minute meal or a 20minute meal..I guess I’ll just have to settle for ”under 20min mea” 🙂 good enough for me. 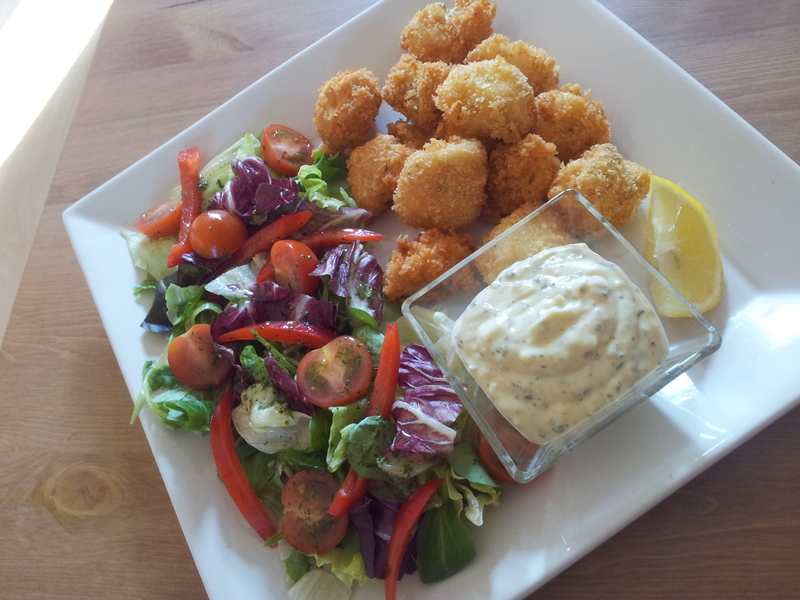 1) take your shrimp and pat it dry, making sure all the legs or shells are removed. I also removed the tails, you could leave them on for presentation , I just think it’s easier to eat them without any shells on. 2) season your shrimp with pepper, salt, chili flakes and 2 finely chopped garlic cloves. let them marinade for 10 min. 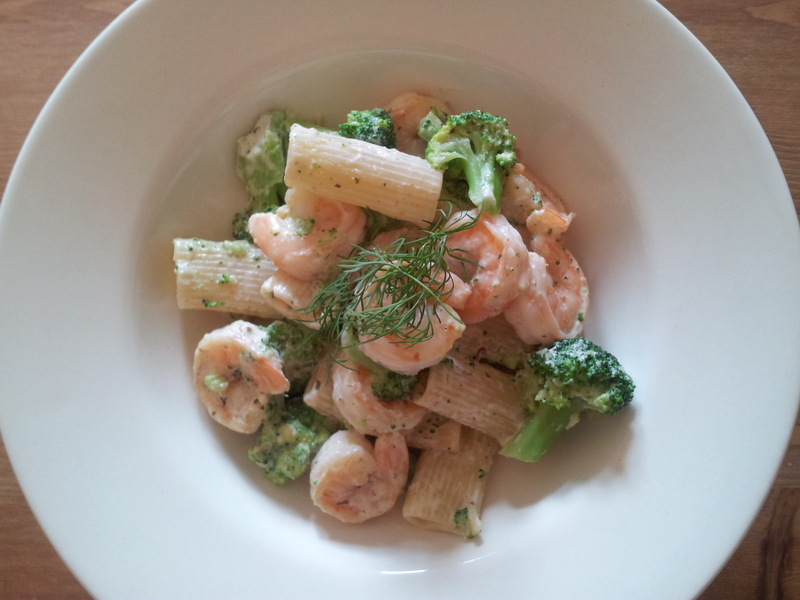 4) Only when you add your brocolli to the pasta, pop your shrimp into a hot pan with a tbsp or two of olive oil in it. they will start turning pink almost right away and when they’re completely coral-pink and white (after about 3-4 min on high heat)instead of translucent and grey- put your philadelphia in, and let it melt. You can turn the heat off, allow it to melt completely. taste it and add some salt or pepper if needed. 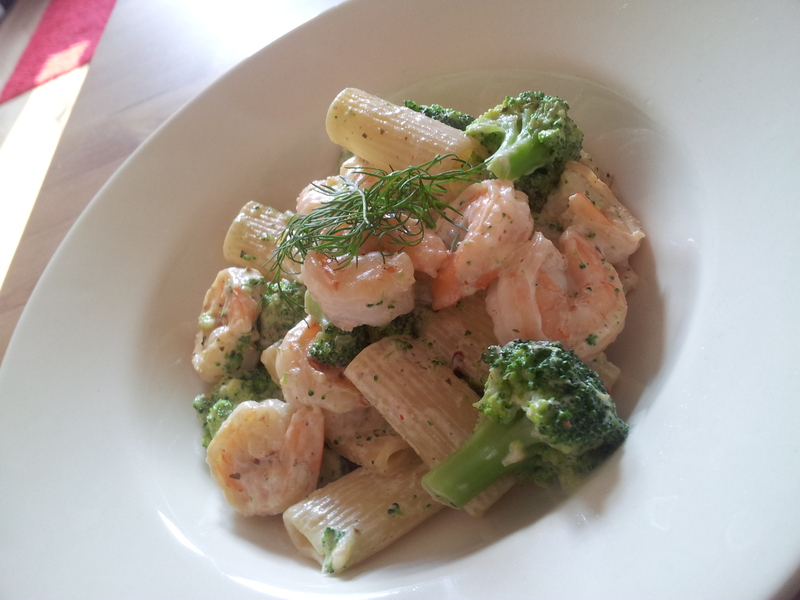 5) strain your pasta & brocolli and add it to your sauce pan with shrimp. stir well,so all the pasta and brocolli is covered with the cream sauce. Sometimes- as rarely as it happens- I don’t feel like fiddling around the kitchen for too long, and I want something simple and easy for dinner. This is a perfect dish when you feel like that, at least in my opinion. it’s a definition of ”mof mof” cooking, – ”minimum of fuss, maximum of flavour” 😉 let’s get started! mixed lettuce – I’m using radicchio, rocket, iceberg- use whatever type of lettuce you like the most. extra: 2 wedges of lemon, kitchen paper to drain extra oil. 1) Heat up your oil and while it’s getting to the right temperature, dice your fish, pat it dry with paper towel, season with salt and lemon pepper. toss evenly in the flower then coat in the egg and finally in the panko crumbs. make sure all the pieces are covered evenly. 2) when your oil is hot enough , place your fish (in 2 batches) in the hot oil and fry until golden and crispy- the colour of the crumbs will be the indication- when it’s golden, it’s ready. 3) when the fish is cooked, remove it from the oil and drain the extra oil onto the paper towel. 4) repeat the process with the second batch of fish. 5) in the meantime, you can assemble your salade, just mix the dressing ingredients, dress the lettuce lightly,it’s not suppose to be drenched, just lightly coated, place onto the plates and put cherry tomatoes and red pepper slithers on top. 6) add a generous amount of fish, with a wedge of lemon to squeeze over the fish. 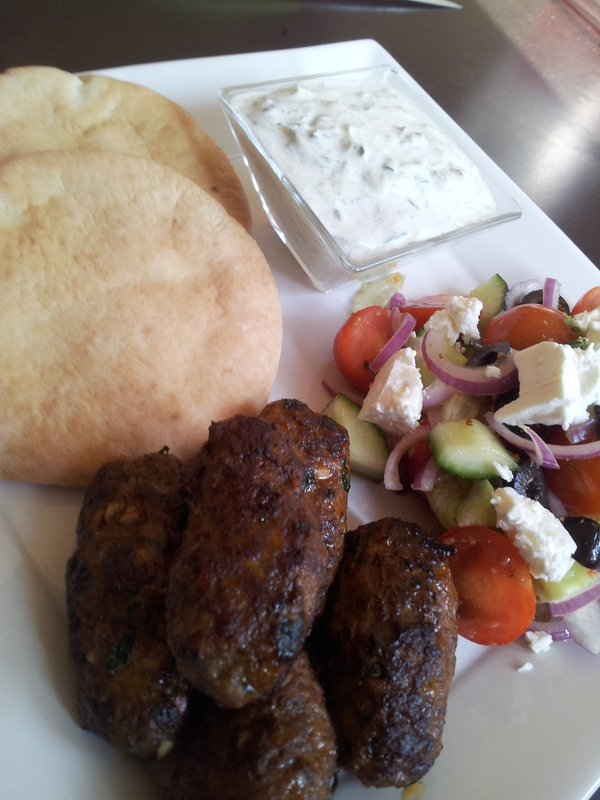 I can honestly say I don’t really cook a lot of greek food. I’m not exactly sure why, because whenever we have it at the restaurant – it’s delicious. The greek are definitely masters of preparing meat, maybe that’s why I was so unsure about cooking greek-I was worried I’m going to just screw it all up, and that I won’t do the delicious greek food I know-any favours. additionally: 2 pita breads per person. Now, I realise that’s a pretty long list of ingredients, but there’s not much cooking involved. All you need to do is prepare the sausages- the rest can be done in advance. 1) Mix your meat with parsley, garlic,chili, oregano,salt,pepper and lemon zeste. mix well until the mixture is well-combined, then pop it in the fridge to rest. 2) when the meat mixture is resting, take your grated cucumber- make sure all the excess water is squeezed out, place it into a bowl,add your salt,pepper, honey,cayenne,olive oil and yoghurt. mix well- your sauce is done. 3) take your meat-mixture out of the fridge and form into neat little sausages (as seen in the picture), you should get about 20. place them in a hot,dry pan, and fry off until nicely browned on each side. I’ve browned them off, then put them into the oven,just to cook through for another 10min, 180C, You could also use a bbq to cook them all the way through. 4) While your sausages are cooking, you can mix and dress your salade, just place all your ingredients into a bowl, (lettuce,tomato,cucumber,red onion,olives,red pepper ) mix well. 5) put all of your dressing ingredients into a small jar and shake- that’s your dressing. dress your salade and crumble the feta over it. 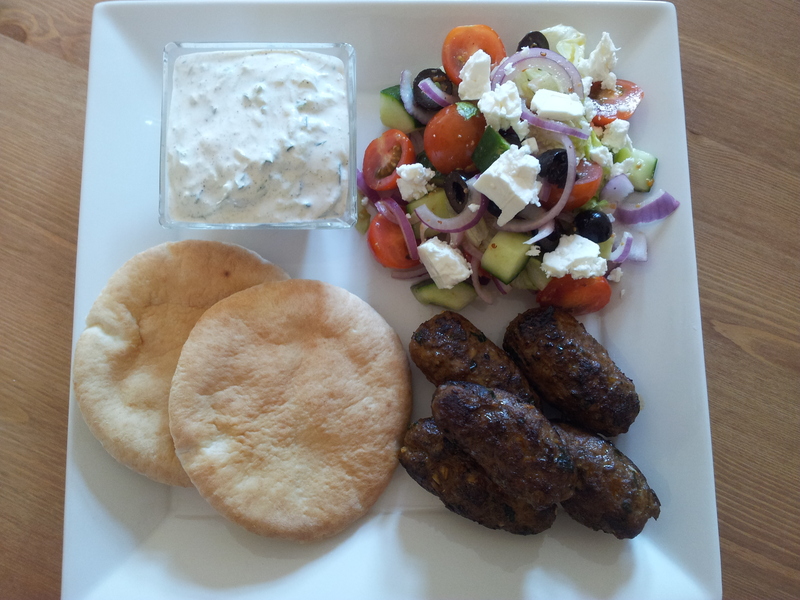 Once all of your components are done- just place the tzatziki into a dip-dish,place horiatiki salade onto the plate, serve 5 sausages per person, add some pita breads you’ve heated up beforehand. 4 leaves of gelatine, soaked in cold water for 10-15min. 1) in a heavy based sauce pan heat up your 50g of butter, 75ml of cream and 6 tbsp of brown sugar, keep stirring until the mixture disolves and becomes smooth. When it comes to a boil let it simmer for 2-3 minutes, until it’s syrupy and becomes to thicken up a little. 2) when the mixture is syrupy, you’ve got your toffee sauce. Remove 4 tbsp of it from the pot into a separate dish- you’ll use it later as a sauce/decoration. it might seem a bit runny, but it will thicken up significantly as it cools down. 3) add the 250ml of cream and 250ml of milk to the remaining toffee sauce in the pot and stir in well. add your instant coffee powder, vanilla extract and let it come to a boil. then take it off the heat completely. 4) take your gelatine, squeeze out the excess water and place them in the pan with hot milk/cream mixture. stir until the gelatine disolves completely. it’s very important that you do not cook the mixture anymore after adding the gelatine, just let it ”rest”, and cool slightly. 5) Your panna cotta mix is ready, you can now place it in 4 forms, it doesn’t really matter what you set it in, I used cappuccino cups, as long as they’re even size, it’s okay. 6) oil your forms very delicately, it will make panna cottas come out much easier, then pour the cooled mix into the forms, dividing it evenly. cover with cling film and place in the fridge for at least 4-5 hours, or until it’s fully set and jelly-ish. 7) when your panna cottas are ready, you can finish the dessert off by cutting your bananas into slices, sprinkling them with sugar and blow-torching them until carmelised, or placing them under a hot grill for a minute or two. 8) the final assembly of your dessert: smear a generous amount of toffee sauce on the bottom of your plate. turn your panna cotta out and place it on one side, place the bananas on the side, add a sprinkling of brown sugar on top of the panna cotta. 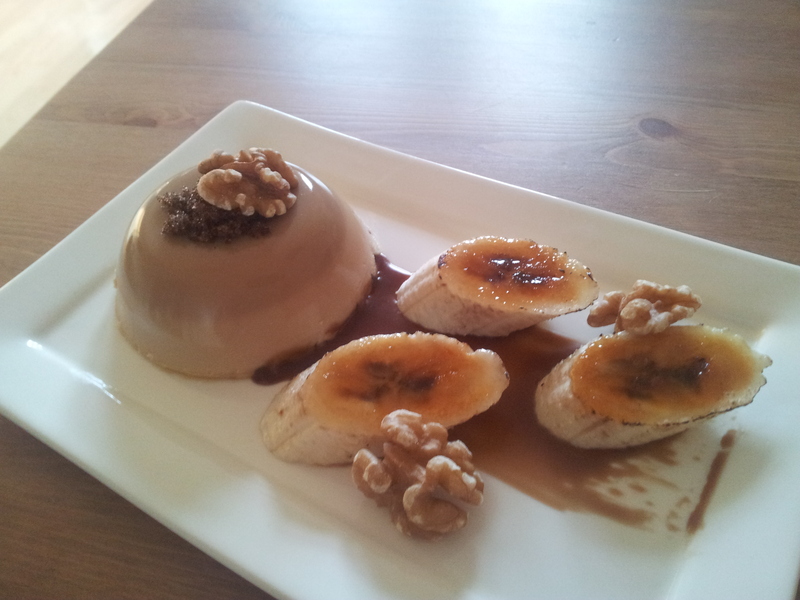 place your walnuts (one on top of the panna cotta). The panna cotta will appear to be double-layered,as the coffee will settle to the bottom slightly, which makes for an interesting effect 😉 enjoy!